Lots of people says, it is hard to really pull down BN, they still have a lot of supporter in Sarawak. I'll say it is different today. In this modern world, more news and multimedia is easily spread through internet, Facebook, Youtube, that we can easily sees lots of information that is not reported by our TV and Newspaper. 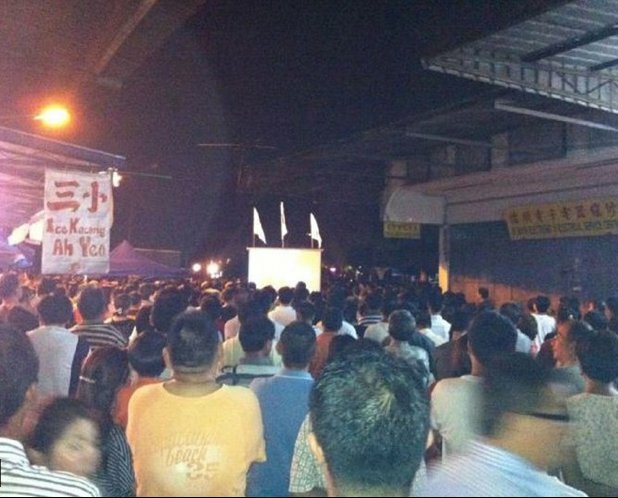 Image belows is taken from Facebook, that shows the very crowded streets for the DAP politic talk in Bintulu. I am quite sure this image will never appear in our TV or Newspaper. Malaysia TV and Newspaper is fully controlled by BN, and all the news is being filtered. In these few days, they only reports on their BN politic talk in Sarawak, how it receive "good" respond from the rakyat. Talking about good respond, they actually RASUAH our rakyat to get the good respond. These are all unwritten agreement, that every person who goes to BN politic talk will actually receive some money in return. I heard of RM16 angpau will be given if you go to BN politic talk in Stutong Kuching last few days. So, you will have to give your name to a so call agent, and gather at some place for the BN politic talk. They even give free 1Malaysia t-shirt to all the participant, and free coupon that you can redeem breakfast at the food court there. Then at the night, the TV will report that BN politic talk is receiving "good" respond from the rakyat. 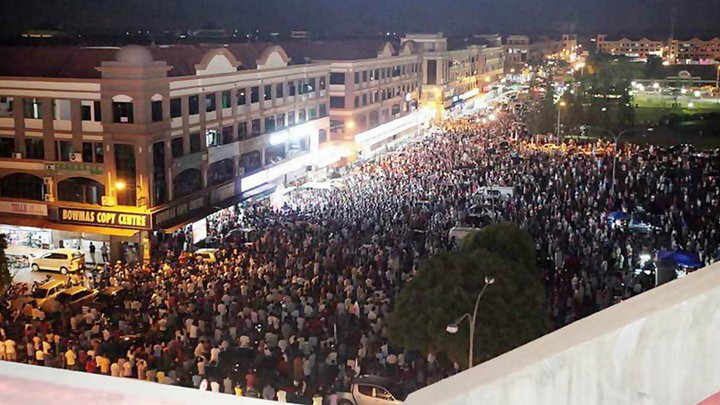 Another photo of crowded people for PR talk in Kuching, also taken from facebook. I don't have much info on this photo. The last one is a joke from BN. Nice one! 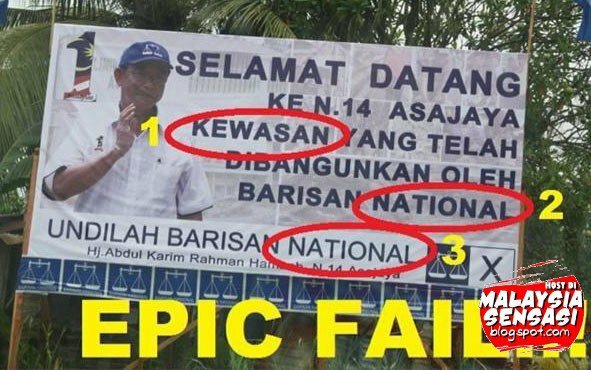 How we can put our undi to someone that is fail in spelling? 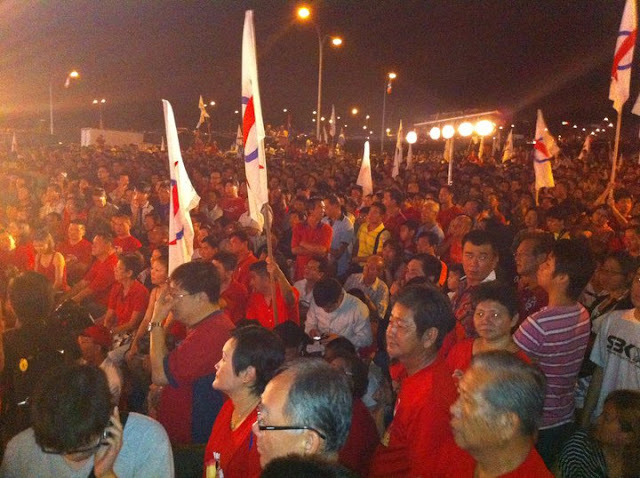 Another photo from Facebook showing the big crowd supporter for DAP. Lets sleep earlier tonight, wake up earlier tomorrow to vote for DAP, PKR or any NON-BN parties. JOM UBAH..